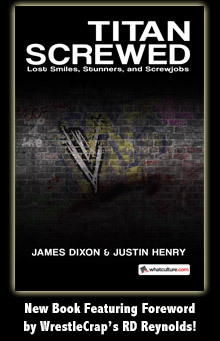 Epic Tweet From Wrestling History 2/22/13 - WrestleCrap - The Very Worst of Pro Wrestling! Gorilla isn’t too fond of spinoffs. 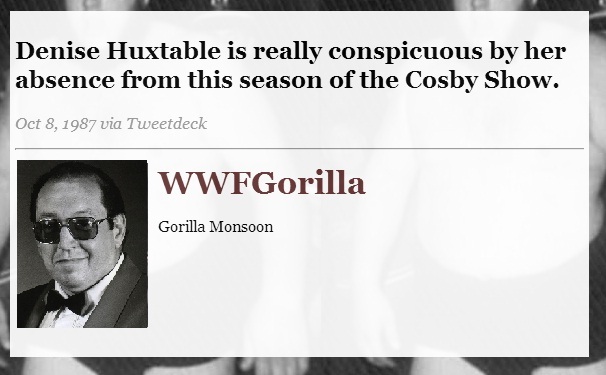 8 Responses to "Epic Tweet From Wrestling History 2/22/13"
I’m glad she left The Cosby Show for her stupid spinoff. She was my least favorite Cosby Show kid. Stopped watching around the time Rudy grew a mustache. Well, at least they didn’t randomly add her during the second season, or Judy Winslow her altogether in the 4th season. Poor Judy- sent to her room never to return again. I bet the new owners of the Winslow house find Judy’s corpse hidden in an upstairs bedroom wall! This Just IN!!! The Chicago suburban house that served as the backdrop for Family Matters has now been torn down…..No sign of Judy Winslow though! Yeah, in Chuck Cunninham’s case, he was replaced by a different actor before being shipped off. heh.